ToyWatch company was founded in Milan in 2005 by the designer Marco Mavilla. The brand has quickly became very famous throughout the world, so one can buy a ToyWatch in many countries worldwide. Mavilla was eager to introduce a new philosophy into the reality, that would surpass the conventional mechanical beauty. ToyWatches are characterized as "Italian watches on the wrists of American stars." Every ToyWatch collection combines the style and emotions. The ToyWatch presents the high quality and the stunning design, that will surely emphasize the bright individuality of the watch owner. ToyWatches are made of different materials, from stainless steel to high-tensile polycarbonate. Being unusual, lightweight and colorful, ToyWatch company has won the hearts of famous people all over the world. Madonna, Michael Jordan, Leonardo DiCaprio, Jessica Alba, Uma Thurman and many other celebrities are among the ToyWatch fans. ToyWatch company offers a rich assortment of watches of fresh, bright and saturated colours: Plasteramic, Pop Plasteramic, Stained Glass Plasteramic, Mini Plasteramic, Fluo Plasteramic, GEM, Luxury Plasteramic, Neon Plasteramic, Pearlized, Oversize Plasteramic, Heavy Metal Plasteramic, Heavy Metal, Mother of Pearl Chrono, Jelly, Jelly Looped, Jelly Army, World Cup Jelly, Jelly Fluo, Mini Jelly, Safari, Tattoo Color, Tattoo, Skeleton, Ceramic, Missoni. Mara Poletti, the president of the company, says, "While creating the watch collections, we wanted to play with the rich colours and produce the accessories with the effect of colour therapy. The combination of contrast colours is the perfect variant for peculiar people, who are ready to emphasize their individuality." ToyWatch offers the fashionable accessories, the company was born as de luxe brand, but it is rather an affordable luxury. You can buy this Italian watch for 200-300 Euros only. According to the ToyWatch watchmakers, the company uses polycarbonate, one of those "noncapricious" materials, that can be combined with other traditional materials, such as steel, ceramics, precious stones and crystals. Some models are equipped with the rotating bezels and decorated with precious or semiprecious stones. ToyWatch company produces watches with colorful dials, as well as chronographs and skeletonized watches with the cases of different shapes: round, square, barrel-shaped. There are also some models with the time indexes, treated with the luminescent coating. 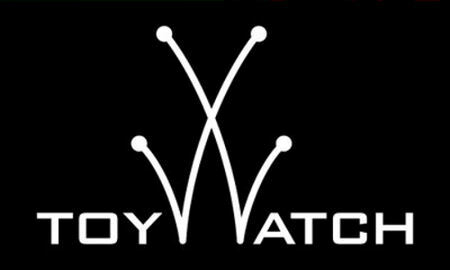 ToyWatch brand has been always tending to amaze his fans and watch connoisseurs. Men's and women's collections by the Italian company are the real breeze of freshness and colour. There are watches of purple, lilac, sunny-yellow, bright orange, acid-green, blue and other colours. ToyWatch's products are for those, who appreciate the time, follow the fashion and want to emphasize their bright personality.